In 1882, pioneering photographer Georges Demeny attached light bulbs to an assistant and told him to jump. Ever since then photographers have been combining moving lights and long exposures to ‘paint’ with light. For a fresh approach to the technique, we thought why not use reflective surfaces to enhance the effect? Whether it be water, glass, mirrors or even simple Photoshop image-flipping, a little reflected symmetry can take amazing light-painted patterns to a whole new level. start experimenting with your exposure. A light painting is created by moving any light source through a dark scene while the camera’s shutter is locked open. In exposure terms light is accumulative, so dragging a torch across the frame is like taking chalk to a blackboard. Light painting needn’t be carried out in the pitch black. In fact, a little dim ambient light will help enormously, as you can see what you’re doing. But the longer the exposure, the more the ambient light plays a part and the lighter the scene will be. You can see in the main image here that the glow from the city beyond the lake has lightened the sky. To the naked eye it was nowhere near as bright – but when exposed for a hundred seconds, it becomes much brighter. Set up on a tripod. It can be tricky to get the framing right so compose loosely. We don’t want the lens hunting for focus, so pre-focus on a point in the scene then switch to manual focus to lock it. DSLRs max out at 30 seconds, which usually isn’t long enough. For more time set Manual mode and dial the shutter speed down to Bulb. This way the shutter stays open for as long as the button is engaged. We need a remote release to lock open the bulb exposure, either a cable release or – even better – a wireless one. DSLRs with Wi-Fi can be triggered with a smartphone and app. Take a test shot to work out the ISO and aperture. Start at ISO100 and f/8, then start a Bulb exposure and try shining your light sources. If it’s too dark, open the aperture or bump up the ISO. An LED torch is a good choice for light painting, as they’re usually fairly strong, and you can shine them through coloured materials. For smooth flowing lines, attach them to a rod or piece of string. Tablet and phone screens can emit plenty of light, so you could use on-screen images to create all manner of light painting effects (such as the New York skyline you’ll see over the page). There are lots of specialist light-painting products out there, but you probably have items around the house that will work just as well. Taping a torch to a standard coloured cup worked for us. Moving around in the dark, particularly near water, is tricky. A weak light such as your phone’s lock screen will help and shouldn’t show in the exposure if you shield the screen from the lens. Kids’ toys, such as lightsabres or other light-emitting wands, are great for light painting. They also make it easier to create smooth, flowing shapes, as you can swing them in steady arcs. After positioning the camera across the water and locking open the shutter, we used a torch and coloured cups attached to a tripod leg to paint half a moth-like shape, starting at the surface of the water. The reflection did the rest. You need to keep a mental picture of the object as you paint with the torches. It’s a bit of a guessing game, but each time you try you learn something, and the next attempt is usually better. Whether painting outside at night or indoors in a dark room, you can get some amazing effects with a little time and effort. Here we placed a small Statue of Liberty figure in the foreground with a tray of water behind. Then we used an iPad screen to paint the buildings. We made a set of images of simple outlines for each individual building, then by scrolling through the images while shifting the iPad across the water, we could create the city, one building at a time. A few torch flashes in the background completed the effect of lights. 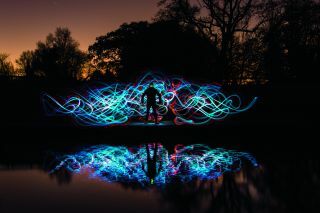 You can have lots of fun with light painting by creating silhouettes, like this sinister-looking figure. All you need to do is move the lights behind a person while they stand perfectly still. Here we took our time, swinging a set of double torches around behind the figure and making sure the entire area behind his body was painted. Once done, we used a green coloured cup in front of the face, flashed twice to create his glowing green eyes. While this project is all about using reflections, sometimes there won’t be any to hand, so instead you could try image-flipping. Here we light painted with a toy lightsabre and once flipped, it looks almost like one of those ink-blot Rorschach tests psychologists use – we see a looming monster, but that’s just us. To flip an image in Photoshop CC or Elements, duplicate the background layer with Ctrl+J then grab the Crop tool and drag out to double the image width. Go to Edit>Transform>Flip Horizontal, then use the Move tool to drag the layer across to the other side.